I spy with my little eye . 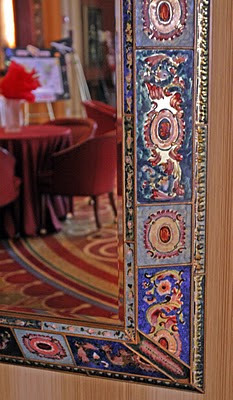 . . the corner of a fabulous Moroccan Mirror at the Hilton Garden Inn that holds much more at a second glance. Its reflection boasts a snapshot of the $2.5 million renovation spearheaded by the owners of the venue who view art, design and luxury as foundations in their unique outlook on hospitality. Catch a glimpse of the patterned wallpaper that gives the walls texture and subtle color which compliments the bold mirror frame. Now focus inward at the graceful repetition of color in the circular floor covering. Its rich, layered look pops in pictures as clients of the Hilton Garden Inn create memories celebrating special occasions in this pre-function area.